When Borden County Was Bone Dry. Just about the only comfort a Texan can take during a severe drought is to be aware that sooner or later it will start raining again. At least it always has. Long before the words “global” and “warming” had anything but their individual meanings, Texas endured periodic extended dry spells. Fortunately, they have never lasted. The seven years of bad luck that still stand as Texas’ worst drought, the period from 1950 to 1957 and the focus of the late novelist Elmer Kelton’s classic work “The Time It Never Rained” is also the state’s best-known near rainless stretch. But those who lived through the 1917-20 drought never forgot it. That early 20th century drought is considered Texas’ third driest period, with a statewide average rainfall of only about 15 inches. The seemingly endless interval of sparse precipitation hit West Texas particularly hard. When Borden County observed its centennial in 1976, the county historical society published a book containing numerous family histories and recollections from early settlers. In that now-scarce book, several folks who had been around for a while remembered the World War I-era drought with no fondness. For those who didn’t go through it, he noted that the county seat of Gail had fewer than five inches of rain in 1917. Nearby Lamesa measured only three inches of precipitation that year. Lack of rain stunted crops and killed off thousands of head of cattle. And when farm and ranch land on the plains gets dry, dust starts blowing. The unrelenting rainlessness left his family several thousand dollars in debt with no cattle and “not much of a way to make a living.” They eventually recovered from the drought and so did the land, but it took a while. Nearly six decades later, he said, piles of “blow sand” built up in pastures during the drought still could be seen. 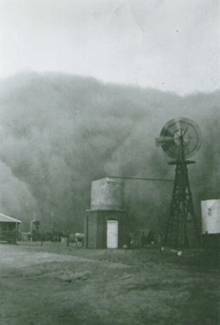 He hated sandstorms and for the rest of his life, dreaded another drought like the one in 1917. Another Borden County resident, Mrs. G.W. Burdett, remembered one of those sandstorms from her childhood. Running inside to tell their mother what they had seen, they forgot the baby. Knowing that her family had only recently moved to West Texas, the other two women on the line assured Mrs. Burdett’s mother that it was only an approaching sandstorm, not the Apocalypse. Even so, they added, she needed to close the house tight and light a lamp. About then is when the already nervous woman counted only two of her three children safely in the house. Rushing outside, she found the baby in the washtub where her two older siblings had left her in their excitement. The infant’s eyes and mouth had already filled with sand. While their mother frantically cleaned up the rescued baby, the other two children watched the duststorm from a window. Half flying and half running, the chickens ran to the henhouse, tricked by the sudden darkness into thinking they should be on the roost. Next their Jersey cow came running up, convinced it must be milking time. When her father finally made it home and the family sat down to a late supper, they discovered all the food had sand in it. “We did not live on the farm very long [after that] as the crops were all blown out and rain did not come to help,” Mrs. Burdett continued. Her father sold their land and the family left Borden County for good. He was so happy to get a little money for his worthless property he did not think to reserve mineral rights. Years later, Mrs. Burdett picked up a copy of Life Magazine and noticed a photograph taken in Gail. In the background, she recognized the house they had once lived in. Behind it stood evidence of one drought-proof “crop” – a field of pumping oil wells.